Philippe Gilbert (Deceuninck-Quick-Step) claimed victory in today’s Paris-Roubaix Classic, after the veteran Belgian rider beat fellow escape companion Nils Politt (Katusha-Alpecin) during a tense sprint for the finish at the Roubaix velodrome. The peloton came under attack by riders like Jurgen Roelandts, Casper Pedersen, Mads Wurtz Schmidt, Andre Greipel, Silvan Dillier and Philippe Gilbert early on in the race, but all were quickly neutralized. From there, several teams such as Bahrain-Merida and Trek-Segafredo tried to take advantage of the wind by setting a high pace at the front of the field, momentarily causing some spits in the peloton before it eventually came back together. Greg Vam Avermaet (CCC Team) later initiated an attack well in advance of the Trouee d’Arenberg, while race hopeful Wout van Aert (Jumbo-Visma) found himself distanced by the peloton after suffering a mechanical problem. However, the Belgian rider was able to commandeer his teammate Pascal Eenkhoorn’s bike to finish the cobbled sector before switching back to his own. But, tragedy struck for van Aert again, who crashed but meters later that left him chasing back to the peloton. Backup front, AG2R La Mondiale’s Stijn Vandenbergh eked out a small lead for himself after the Arenberg, but was eventually caught by the reduced peloton. With 67 kilometers to go, Politt, Gilbert and Rüdiger Selig (Bora-hansgrohe) attacked, subsequently building up a slight gap for themselves. 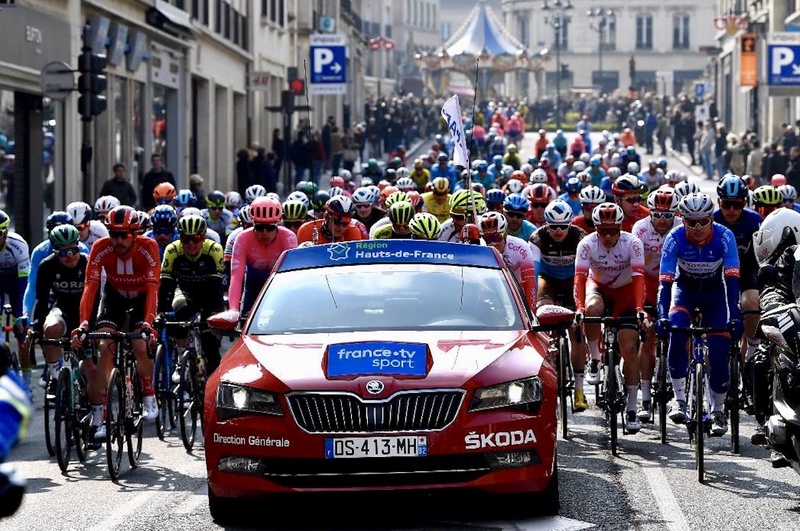 During the 12th cobbled sector, Selig was dropped by his fellow escapees, while a chase group formed by riders like Peter Sagan, Van Aert, Ivan Garcia Cortina, Yves Lampaert and Christopher Laporte lead the pursuit in earnest. At the front, Gilbert managed to distance Politt, taking to the front alone for a short period. However, with 48 kilometers to go, the chase was successful at reeling Gilbert in. But, as the kilometers continued to roll by only van Aert, Politt, Sep Vanmarcke, Gilbert and Sagan were able to remain out front. With 20 kilometers remaining, Gilbert launched an attack, which was quickly marked by Politt and Sagan, while the others were left struggling behind. But, a determined Vanmarcke and Lampaert later regained contact with the two leaders. Gilbert decided to attack again along the fourth cobbled sector, with Sagan being the only rider that could follow. But, the two leaders were quickly caught, with Politt immediately attacking with Gilbert keen to mark his move. The duo proceeded to reach Roubaix Velodrome together, where after some tense moments, Gilbert launched his winning move to best Politt in the final sprint for the finish. Meanwhile, Lampaert claimed the last spot on the podium, finishing just ahead of Vanmarcke.